Hello my friends! I thought I’d share with you some early thoughts for probably the biggest project I’m planning this year. 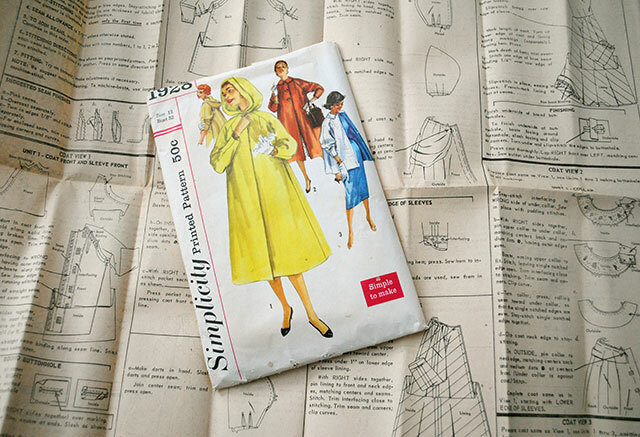 I’m going to sew Simplicity 1928, a swing coat pattern from 1956. The best part about this pattern? A HOOD! Hoods are a huge winner on coats and jackets in my book. I’ll be doing view 1. I was looking for a swing coat pattern earlier this winter and then stumbled on this one for a good price, and I couldn’t resist the hood! The pattern is fully lined, with self-fabric used to line the hood. I feel a little iffy about the inner construction as written: there’s no back neck facing, so I feel like the lining could roll out to the hood, and there are no front facings, either, which I find odd. The vintage coats I own have both. But maybe that’s part of why this was marked “simple to make” at the bottom of the envelope…? I’ll definitely draft both a back neck facing and front facings. I’m also going to add more than one button down the front. I just now caught that version 2 has 3 buttons, though I might want to space them a tad wider apart so they’re more useful. So I sucked in my breath, crossed my fingers, and bought this coating fabric, sight unseen. Because really. Isn’t it gorgeous looking?! Does that not look like the amazing makings of a swing coat?! I’m giddy just thinking about it. It’s a heavy wool coating with white rayon threads through it. I’m already second-guessing that I didn’t pick up an extra yard. But I do plan to do a muslin, and the cutting layout was with or without nap (I’m not sure if the fabric has nap), and I’ll probably make it slightly shorter because I always need to chop a few inches off, and assuming I don’t make any asinine errors… even with having to add facings, I should be okay with 4 yards. I plan to line the coat and probably interline it, too. I want this to be warm, because one thing I find is that most wool coats just don’t cut it when we start reaching the period of winter when even the weather forecasters call it “brutally cold”. Gah, anything to keep me out of my down puffy coats… but I digress. And then there’s underlining, or interlining. From what I understand, in the context of jackets and coats, interlining is really just underlining for warmth, not specifically to change the hand or opacity of a fabric. I already know that the common option of cotton flannel is out. I want warm, like dead of winter warm. I’ve read that you can use silk organza as an underlining, but I’ll have to wait and see what the coating fabric is like since it feels like that might be too crisp. Though this Threads article on underlining points out that if you have a shape that hangs loose-fitting and full (like my pattern does), you might want to interline your lining instead of the fashion fabric. Would it be odd to effectively underline a silk charmeuse lining with silk organza? Well I’m not sure silk organza would add that much extra warmth, anyway. So in the ‘much warmer’ department, I did consider interlining with actual Thinsulate fabric, though it’s out of stock in several places—given the season, that doesn’t surprise me, and I’m having a hard time figuring out weights anyway. So this might not really be an option. But the same Threads article also mentions lambswool interlining, and that sounds promising (and more vintage, though I’m not a stickler about that). 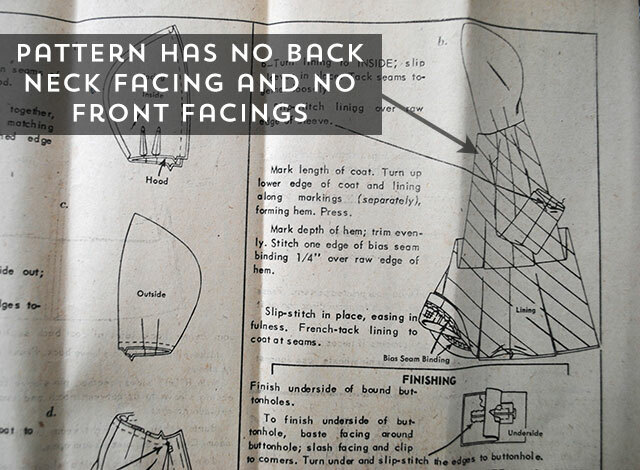 Via this post on lambswool interlining, I see that Bergen Tailor Supply sells it and it sounds good. Not much of a description, but presumably would be suitable for my coat. Of course, all of this is somewhat dependent on what the coating fabric is actually like in person, and how heavy it is! Because I think it’s pretty heavy. The good news is that I’m not doing a bulky collar, and I’m probably lining the hood with something other than self-fabric (but what?? ), so even if it’s pretty hefty things shouldn’t get too bulky. Except possibly the inseam side pockets, since I’d like to interline them too (I mean if I’m going for warm, let’s go for warm). We’ll see how that all plays out. This is not the first time I’ve ventured into tailoring, but it’s only the second. So I’m excited but slightly nervous. Almost two years ago at this point I took on my first tailoring project, sewing my Sew for Victory jacket, and documenting the entire process. While I remember some really nerve-wracking bits, I also remember geeking out on a lot of the small details. I enjoyed slowing down, all the hand basting and finger pressing of seams, and things like that. I may do some documenting along the way with this coat. It’ll probably bore some of you to tears, but hopefully others will find it interesting! devra from puu’s door fo time just underlined her gerard coat with lambswool i think – it might be worth dropping her a line or comment on her recent blog post? that’s a great pattern – it’s going to look lovely! Thanks for the heads up, I’ll check it out! i did, in fact, use lambswool interlining. to my knowledge the two best places to get it are bergen tailoring supply (which you linked in your post) or you can phone steinlauf and stoller in NYC and they will post it to you. when you use the lambswool, you can underline the charmeuse if you want (interlining) or underline the fashion fabric. it will change the drape of the charmeuse, obviously, but for me it is worth it for the extra warmth and still getting to keep the lovely texture of the silk. when i did my gerard i underlined the fashion fabric – just a personal choice – but last year when i did a watson jacket i interlined the lining and then quilted it. 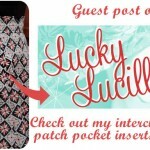 ginger makes just did that on her own gerard and her post on her completed make has a lot more info than my WIP post. Totally agree about it not being problematic changing the charmeuse drape. Actually, I just went and examined a vintage swing coat in my closet and since it had a free hanging lining, I could peek up and discovered that the lining fabric has what I believe is a layer of lambswool interlining (at least from the open weave description). And wow– I had completely missed that Sonja quilted her Gerard lining. It didn’t register as “this is a quilted lining, take note, future self”. DUH! And your Gerry is going to be amazing! Hi looks exciting. I have been learning tailoring tricks for the last couple of years from Ann Ladbury (she was on TV for years and has written 40 books on sewing), anyway she is brill on linings, alterations, what fabrics work well together and I would happily pass on any questions for you. My friend made a cape with a hood recently and used fleece in the hood, not v glamorous but Ann did point out that it stays on your head and doesn’t slide like lining as well as being cosy. Good luck with it, I agree about facings too and thanks for the blog! Thanks Jenni, how kind of you to offer! I like the idea of fleece in the hood, or something similar. I want it to be warm and cozy. So I definitely won’t be using the slippery lining fabric. If I can’t settle on a good fabric I’ll use self-fabric, but I do think it would be extra nice to wear with something fleecy or faux fur or the like. I am in the process of making a wool coat with a hood from a Burda pattern. I wound up using organza for an underlining on the wool because the coating I picked was slightly loose in weave. In addition I did an interlining in cotton flannel. I washed the flannel first to shrink it and make it more dense. This I worked as one with the charmeuse lining. The hood is self lined without any flannel between the layers. Now, I live in Washington state where it rarely gets much below freezing, much different than the Midwest where you live. I am thinking you could use wool flannel instead of cotton and a beefy charmeuse lining and wind up with a pretty warm coat. Thanks Lynn, sounds like what you’re doing is similar to what I’m thinking about! I don’t know much about silk charmeuse so I didn’t know some might be heavier than others. I’ll have to pay attention when I start hunting. Look for the “momme” count – that’s the weight of the silk. The higher the number, the heavier the fabric. If you are looking for really wide pieces to line your coat with, it may be cheaper to look for a set of silk charmeuse sheets, rather than fabric bty. Good to know, thanks Christine! Do you want to stick to period authentic fabrics? If not, go with thinsulate as underlining. I made a coat with it and it’s so warm that I rarely have a chance to wear it in the DC area. As I mentioned in the post I’m not adverse to non-period options but Thinsulate doesn’t seem to be easy to come by right now. I do think lambswool would be a nice warm option too. But we’ll see how much warmth I need to add once the fabric arrives though! Though I don’t think there’s such a thing as a coat that’s too warm to wear in Chicago in winter, lol! 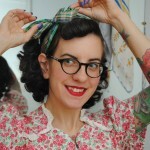 PS: There is a vintage give~away on my blog if you're interested! Thanks Michelle! You have some delightful goodies in your giveaway, eep! It’s true. It should. I’m a tailor, born and raised in former Soviet Union. Thats how I taught how a winter coat should be done – fashion fabric+wool batting (thats the lambs wool interlining) , lining +flannel. Thats the way I’ve been making all my coats for 10 years. And where I live, it gets real cold during the winter…like -15°C cold. Thank you for sharing your expertise! It’s -6°F / -21°C at the moment here so I can relate. 🙂 I’m really intrigued by the idea of quilting the lining to flannel, I initially mistook what you said to say ‘quilted flannel’ but it subconsciously slipped into my head since last night I was investigating the idea of how to quilt a coat lining to another fabric, but didn’t turn anything up. I know you need to leave the interlining free from the seam allowances, so I’ve been trying to think about how that would all work. That sounds really cool! I love coats with hoods, but it seems to be just shy of impossible to find a vintage coat earlier than the 70s with one. I can’t wait to see how this turns out! I know, I don’t have any vintage coats with a hood! It even took me years to find a cute modern raincoat that has a hood! I would go with a lightweight thin wool interlining. I have a 1940s swing coat that is interlined with what almost looks like burlap! But wool. Its very coarse and open weave. The lining is rayon or silk. I am assuming its not interlined like that in the sleeves, but the body of the coat is and I can tell because the hem of the lining is not tacked down so you can lift it and see underneath. If you’re going nice wool for the outer, and silk for the lining, it would be a shame to add a synthetic in there (assuming thinsulate is synthetic, I’ve not heard of it here in Aus). OH – and the infamous green coat I am making that has sat in my UFO pile for TWO YEARS, I have interlined the cashmere coating which is quite thick, with silk organza – and will prob interline the lining fabric as well. Not just for warmth but to make handling slippery silk a lot easier. Goddamn I need to finish that coat already. Its friggin amazing and its just sitting there. Do it, do it! I like the idea of underlining both fabrics. I’ll have to see what this coating ends up like in person, I’m so anxious to find out!! Then I’ll have an idea of what I really want to add to it warmth- and weight-wise. I had a vintage coat that I wore to death. Then I decided to rescue all the buttons and hardware. Well between the lining and fashion fabric at the back, there was a skin (looks like chamois – always make me think of washing cars!) that was tacked in a few places. It was just in the upper back, nothing below the waist. My coat was a below the knee and cinched at the waist with a fabric belt. Oh, but If you worry about the cold, maybe a swing coat would let too much breeze come in from below? Ooh I also saw this in a high end RTW jacket from the 90s that I pulled apart. It was definitely chamois, and it just covered the back “yoke” or so on t he inside. And the one from that coat was made of a bunch of different sized rectangles, zigzagged together with different colored thread. Clearly, this was never meant to be seen! I am about half done with a super similar coat, but mine has four buttons and I am doing the collar version. I underlined it with flannel and it seems like it will be heavy and warm. It is a thick wool, but the weave is kind of loose. I am lining it with silk, and I think it will get me through the rest of the Chicago winter! Ooh! This will be so cool! And what a fun project! OK, here’s my two cents- you could use lambswool (you can call and order it from Steinlauf & Stoller here in NYC… I picked some up in store for myself and for Devra from Puu’s Door of Time like someone mentioned upstream and it’s very nice). It’s very sort of light and loosely woven, and quite fuzzy, like roving. Another option that’s very easy to handle is what I used for my Gerard, wool flannel. It’s thicker than regular cotton flannel and much warmer. You could even use both! I know how cold Chicago winters are… especially right now, yuck! I would probably quilt the interlining to the lining fabric. It’s much quicker to do than it seems and less annoying, IMO, than trying to take it down here or there. As far as linings go, silk charmeuse isn’t any harder to cut or sew than rayon bemberg. I like both of them. They say that silk doesn’t handle any kind of perspiration well, but that’s probably not an issue in a winter coat. Charmeuse is sometimes thicker than rayon, which could be nice. I haven’t used it, but I know Devra used a flannel-backed satin (like this: http://www.voguefabricsstore.com/Kasha-Satin-Winter-Coat-Lining-Black.html), and then interlined with the lambswool. That would probably be HEAVY in a full-length coat, but would definitely be warm! great minds think alike! sorry to pop in again, but sonja is completely correct! and in terms of bulk in the seam allowances, i have two suggestions: the first is that you can catch-stitch your interlining to the silk and leave out the seam allowances. or, what i do (as taught to me by kenneth king) is cut two extra pattern pieces out in muslin, then stitch them together, trim the lambswool out of the seam allowance, and take it from there. excellent way to reduce bulk even if it does add extra time to the prep phase. also, FWIW, i’ve found the lambswool to not be too heavy and to be lovely and warm because of its open weave. By all means, pop away! I appreciate it! Ooh I love Kenneth King, would be amazing to take a class with him. But I’m not entirely sure I understand the muslin and extra pattern pieces part though, trying to wrap my brain around what you meant! I did manage to track down a blog post where someone had cut the lining and lambswool pieces out at least 1″ larger than the pattern (under the assumption that the quilting will eat up a bit of fabric), basted, then quilted the lines, then laid the pattern piece on top and cut them out to the right size. Doesn’t keep the bulk out of the seam allowances, though. Although perhaps you could conceivably have the quilting stop shy of where the seam allowance would be in the first place (not sure how you’d be anywhere near precise about that if you were cutting a larger seam allowance to begin with, though perhaps it doesn’t matter), so then you could trim it away and catch stitch it to the lining. Or, just trim off the seam allowance of the lambswool except for where the quilting lines are and call it a day, since that would hardly add much bulk (just be slightly fussy to do). Sorry, now I’m just working things out in my head out loud. 😛 If you can’t tell I’m super intrigued by this idea! while i totally agree that if one is planning properly (as in, not me) it would be a good idea to cut larger-than-needed pieces for the quilting…i do not usually do that. i have not (yet) had an issue where the shrinkage from the quilting was noticeable or problematic. regarding the extra pieces, the way i do it is this: i take, for example, the side front piece and cut it out in the fashion fabric, the lining, the lambswool, and a piece of muslin (or other thin, cheap cotton as one would use for a toile). i take the lambswool and the muslin, lay them on top of each other, and about an inch in from the cut edge i sew the pieces together. then i trim the lambswool out of that seam allowance and have a nice, thin piece of fabric for where the seams will intersect. this method works best if you have traced out your pattern pieces using wax paper and a tracer (so you can see your proper seam line), but that step is not 100% necessary. as i finish my gerard (hoping in the next few days) i will try to take extra photos of the inside for my finished make post, so that you can see where i’ve done this. you can also see it in my WIP post for my marcy 1756 jacket, where i used the technique with hymo/hair canvas. I admire your desire to sew a seriously warm coat that actually looks nice. I have a big down puffy coat like you mentioned, and although it’s super warm, it’s not very flattering. Oh well! I love the yellow coat. I think you need to make a yellow swing coat next so I can drool at it. How exciting! I’ve always wanted to make one! However, I inherited my grammy’s “Cuddle Coat” so I’m sticking with that for now. Silk charmeuse makes a wonderful lining. I’ve been thinking a lot about linings after going camping last weekend and doing my yearly gear/tehcnical garment inspection and shopping. If I were making one of these, I would make a quilted lining with wool batting instead of cotton. SmartWool has started making puffy vest/coats but they’re using wool roving instead down and it is much less poofy. I think a layer like that would really cut the wind and since the coat is shapeless, even if it is a tad bulky it shouldn’t affect the silhouette. I’ve lined a wool coat with (I think it’s called) Kasha, which is a flannel backed satin and I underlined with flannel. Super warm! That pattern and fabric are to die for! I have bought almost every vintage 40s or 50s coat I have seen with a hood on it, along with every pattern for a coat with a hood on it! All in an attempt to make my wardrobe closer to Lynn Bracken’s in LA Confidential! So, needless to say, I am SO excited to see how this turns out! I hope the fabric weight ends up being okay! For a wool coat, to make it warmer I have sometimes used thinsulate, flannel, etc., but have found the result can be too heavy. From my childhood, my Mom and her sisters always had their “heavy” coats. One of my aunts still had one and I took a look saw it was a flannel backed satin lining. I am finishing up a coat and found it on line, it is called Kasha Satin. I like it, and was able to remove the flannel. It makes sewing the coat easier with only the fashion fabric and the lining to work with and I have the warmth I need. Can’t wait to see the finished coat. 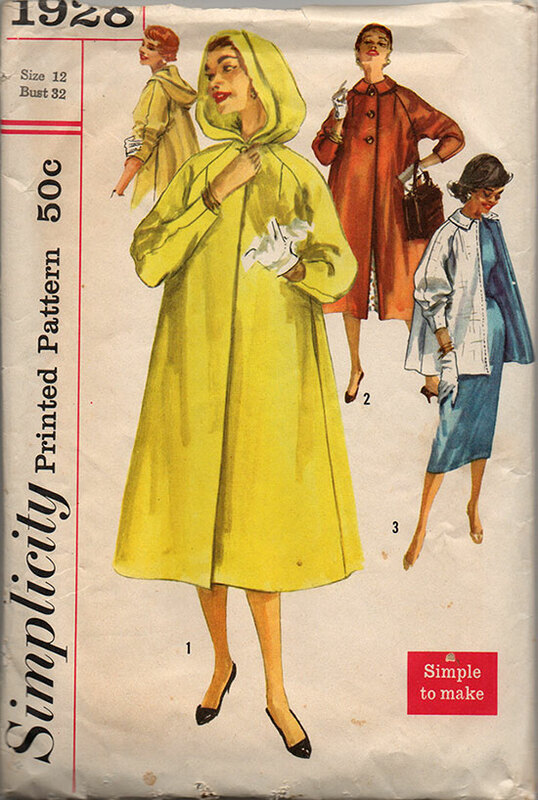 I have the same pattern in my stash and have considered making a rain coat – not quite cold enough here for a warm winter coat. So, I looking forward to seeing how it turns out. Oh, I love this pattern! I’m sure you’ll do it justice no matter how you decide to finish it. The fabric you’ve chosen looks so nice I hope it’s everything you want it to be. I can’t wait to see it! Looking forward to seeing your process and the end result. I have a 1970s coat I got off Etsy a few years ago, and I’ve had to patch the lining at the armholes so many times. My plan is to replace the lining this summer, and I was also thinking of adding another interlining to it for warmth. It would make the mornings at the kids’ bus stop so much warmer! 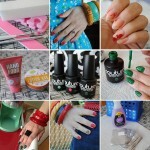 Hi there^^ I just startet following your blog today – and now you’re planning a coat! With a hood! Yeay^^ Can’t wait to see the finished garment. The fabric looks awesome by the way and I hope it will be enough. How about fake fur for the inside of the hood? 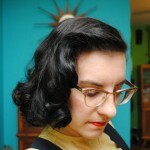 I’m not sure if it’s in keeping with the 50’s style, but it would certainly be warm. 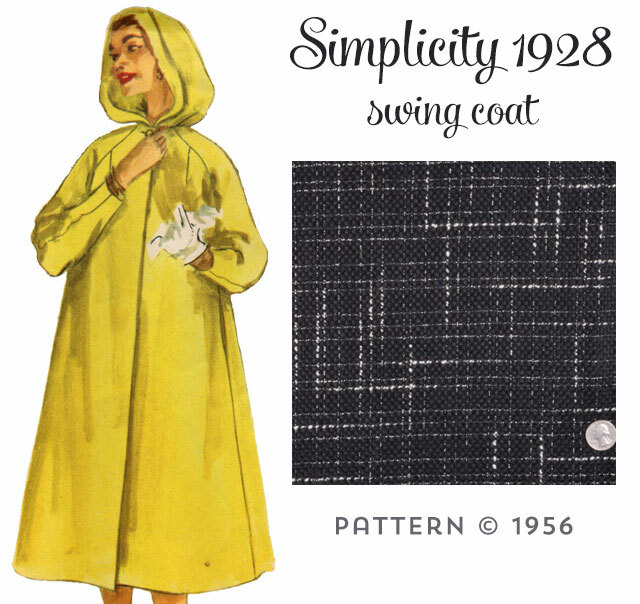 I LOVE this swing coat pattern! I think that the fabric you bought will be perfect. I’m very curious about the lambswool interlining you note. That seems like a great option for warmth. I’m not convinced I’ll ever be able to not wear a sleeping bag coat during winter, but I’d love to have the option to put-it-off until we hit negative temps. My immediate thoughts, even before I read the comments were: Kasha lining (flannel backed, shiny satin right side) with a chamois interlining (Caroline’s comment). I live in central Canada and all the older ladies at church talk about a chamois lining when they see me in my vintage coats. Unfortunately, I do not believe that any of my coats have that but my warmest, tweed has a loosely woven layer of lambswool. I would like to make a coat with a vintage pattern (princess coat) but I have enough truly vintage ones to make that difficult to justify. Looking forward to your decisions and the finished garment! Or you can interline with a cheap wool flannel in the same or similar color to the lining. This is going to be so beautiful! I believe you want something called Sunback lining. It’s heavy rayon satin with a flannely backing. You need a heavier lining for a coat anyway. Bemberg will not hold up the wear and tear. I’ve always found it at stores in the NYC garment district (near my office–lucky me!). I haven’t shopped for it lately, though. Don’t worry about too much wind going up the swing coat. I have a long Max Mara swing coat dating to 1997. Very heavy wool coating. It is loose enough to put a sweater underneath, so it’s my go-to for the coldest days. Yep, I think this is the same thing (perhaps a brand name difference) than the Kasha lining I’ve had a few recommendations for upstream. My only concern is at least online, there are very few colors and I was kind of hoping to do a fun contrast lining. Since I posted I received my fabric and it’s not particularly heavy, so even with lining and possibly a separate interlining I may be looking at less of a wintery coat than I planned, but it should still be gorgeous as the fabric is wonderful! Years ago you used to be able to buy flannel backed satin. I made a coat with it and it was really warm. I made a wool coat in the fall and I couldn’t find the flannel backed satin. To line my coat, I used a heavy satin I picked up at an estate sale and basted flannel to it that I picked up at JoAnn’s. It’s a pretty warm coat and I’m really happy with the results. This will be amazing! I really hope the fabric works out for you and you find a good lining for it. I look forward to seeing your progress. I must admit the idea of lining with anything satin related scares the heck out of me, after my last sewing project (with flannel backed satin) I plan to avoid anything satin like the plague. Good luck to you. I hope that you are looking at old posts and consider answering my question: The sizing on this pattern (being from ca. 1956) is 12 Bust 32. Are you able to fit this size or are you enlarging this pattern? I have an opportunity to buy this pattern in the size 12 but I am hesitating because of the challenge of making it larger. Also just for the record, I used to own a vintage jacket that looked like the collared, shorter version shown on this pattern. It was wool and had rhinestones and beading in the pattern of flowers embellishing the collar. One VERY large carved button at the top was the closure. I loved it. It had some small moth holes on the shoulder and I ended up giving it to a high school senior who was into vintage clothing. But I’ve always wanted to make another or two . . . perhaps a solid and a plaid . . . So, I would appreciate it if you could let me know what you did re: the sizing. Thanks!